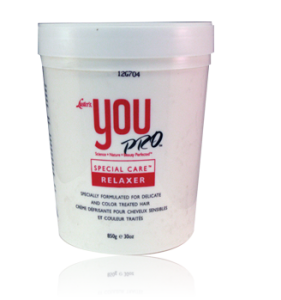 YOU PRO™ Special Care™ Relaxer Specially formulated for delicate and color treated hair. This innovative sodium formula effectively and safely relaxes color treated hair. Excellent for texturizing and frizz control without removing all the curl and or wave. “EOC” (Emulsified Oil Complex) Imparts essential and critical conditioners. Also safe for children, teens and senior clients.